I meant to post this yesterday, but having six extra people in my house has been making it difficult to have any down time. My favorite aunt and uncle and their four kids have been visiting for the past week, and we've been busy showing them around the area. Somehow I've managed to write a lot, though? First line written for camp—"A few people glanced at her, but no one payed much attention to the girl who had once been their princess." Last line written—" 'I thought I’d killed you all,' she said." Worst line—"...the wind winding its cold fingers around her..."
Favorite line—"Barrow, whose face and chest were a patchwork of cuts and bruises. Barrow, whose thin nose looked painfully broken. Barrow, whose eyes were full of more terror and relief and longing than Danica thought a person could feel at one time. “Danica.” His voice was rough with desperation, aching, and something deep and intimate." 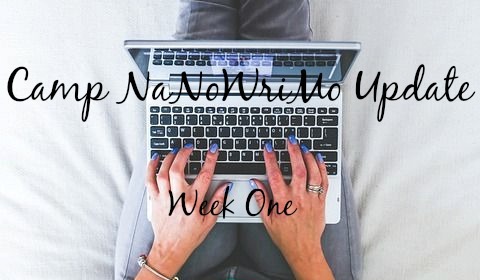 How's Camp Nano going for you? Did you have the same problem with the updater? If you're not doing Camp, how's your writing going? Ugh, I definitely had the same trouble with the updater. I was a bug on the site I think, but they got it cleared up really quickly once people started reporting it in, which was awesome of the NaNo guys. Love that quote about Barrow. All the emotions! I'm glad your writing is still going so well. Good on you for getting so much done with people staying over! My camp's been going pretty well actually, apart from an annoying wrist injury with the worst timing ever. Still, one stops for nothing during Camp NaNo! My gosh, a wrist injury during NaNo would be the worst! Glad you can still write, though. Ugh yes. What happened to that? Like ... Wahhhht? OH MY GOSH YOU'RE DOING SO AMAZING AHHH. Yay for progress and good lines! I'm a little behind, but I'm catching up! I can do zis. XD I hope you have great time writing and with your family! Ugh, getting behind is no fun. Good luck! We got this.